Profits Eternity is a old automated binary options trading robot that opened in October 2016. This trading software that Profits Eternity is raving about is actually a generic white label trading system that is marketed under many generic names. New investors in binary options are not aware of the fact that each week another auto trading robot is launched. 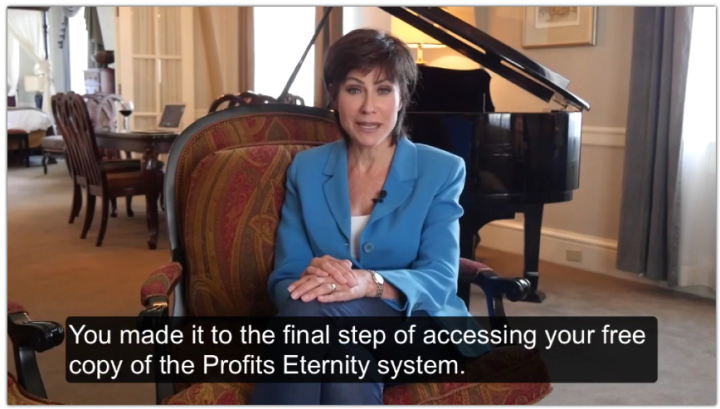 You should know, that you will lose money using the Profits Eternity system. We expose the full scam here. What is new about this product, is that they are using a female actress Jane Creswell, instead of the typical macho guys. The sad truth is that Jane Creswell is a fake actress and although they wrote in big bold letters across the top of their website “Make $6451 per day, GUARANTEED with my free system”, there is no one who will pay you the guarantee! Once you lose your money it is gone forever. We start our review of all trading robots, but going through the entire signup process. Once we get inside the trading software, we look at the trading room, or dashboard. This is the best way to know if the software is worthwhile or just another get rich quick scam. When you look at the Profits Eternity software setting page, it is basically empty. It doesn’t give us any real control on the software like a real trading robot. That is correct, the only thing a trader can control, is the amount of money to lose on each trade, and nothing else! This tells us that the software behind the product is just a random number generator, that randomly places trades, with no builtin technical analysis. The actual place to login to the software is at: http://profitseternitysystem.com/login. ScamBroker.com is a website that is dedicated to reviewing brokers, and to date we reviewed over 200 brokers, with many of them being unlicensed fraud operations. You must read the article; Why people use licensed brokers, unless you also want to lose your money. A software like Profits Eternity connects you with their partner brokers, and in our case they connected us with CFDStocks, which is an unlicensed broker. We have a simple rule when it comes to binary options trading, and that is to only trade with a licensed and regulated no matter what they say! You should go look at the best brokers page. You have 2 choices to make; either find a real binary options broker, that is licensed and regulated, see here. Or do some research of these auto trading robots, which have settings that you can control, see here. Please tell other people reading the review of Profits Eternity, how much money you lost, in the comments section below.